There once was a time when “food delivery” was specific to just Chinese or pizza. That time has long passed. These days, consumers can order any food for delivery. And with services like Uber entering the fray, the competition is fierce. Even well-established brands, like Papa John’s, are struggling to stay top of mind when customers are considering their meal-time options. 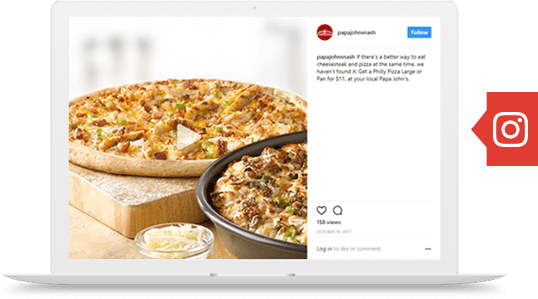 “Consideration” is precisely why the national pizza chain partnered with Cardinal – to help their franchise locations outwit and outlast, the competition, all while driving direct response to cover the cost of advertising – and then some. 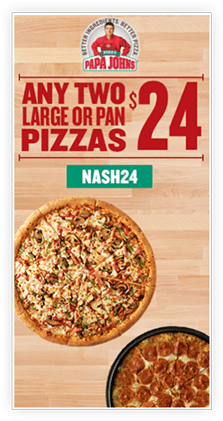 Papa John’s Atlanta saw their programmatic display ROAS double from $6.40 to $12.71. 2017 was an extremely successful year for our partnership with Papa John’s. While the numbers speak for themselves, the behind-the-scenes work required to achieve this kind of growth across various co-ops and franchise locations is the real star. This is especially relevant when working with a national brand that has difference challenges unique to each market – all within an industry where trends and behaviors change in an instant. Adaptability is the name of the game. Cardinal’s approach to tackling these challenges is three-pronged: (1) understand each market’s unique situation, audiences and opportunities, (2) let the data do the talking, and (3) execute media buys in-house to save on markups costs and remain in charge or the data. Because our team of media buyers sits within the 4 walls of Cardinal, we’re able to provide results from a digital media mix that is ever-changing and ever-improving. One of the major challenges Papa John’s faces in the Atlanta market, is consideration. 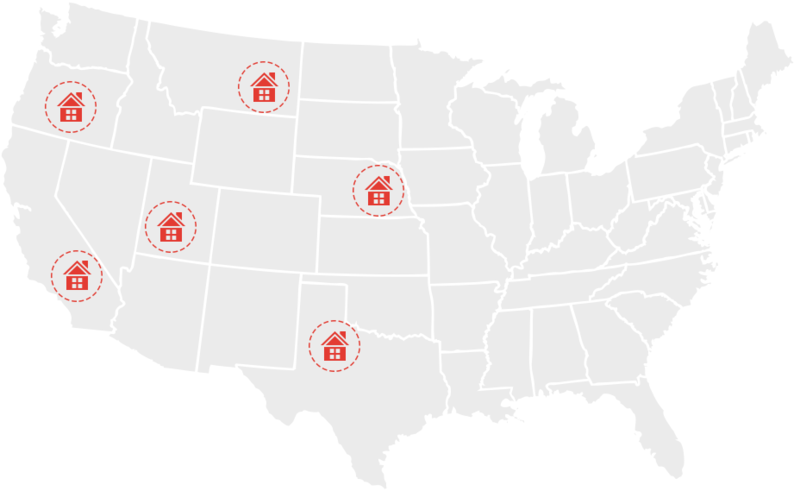 Not only have new pizza delivery companies saturated the market, but the rise of food delivery services in the city and the propensity of the younger demographic to use those technologies, has outranked that of many cities across the nation. The goal for us then becomes: How can we make sure Papa John’s is an obvious choice for customers when they decide to order food? After some careful consideration (no pun intended), we concluded that the channel best suited to complement our existing (and historically Direct Response) approach was to layer in video. 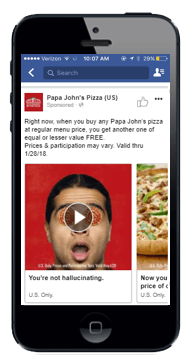 Video advertising is a cost-effective, high volume, and high engagement medium through which to get the Papa John’s brand – and our local offers – in front of more people during that desirable consideration stage. Exploring various video advertising methods…. Ads are served to YouTube user before the content they’re trying to watch. If the viewer skips the video after the first 15 seconds, we don’t pay for the view. We’re only charged for the view if someone watches the ad to completion. 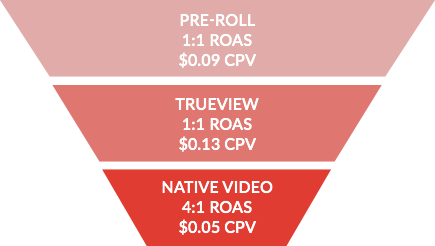 Not only did each consideration tactic pay for itself with a minimum return of 1:1, but the Native video tactic drove enough post-view orders to achieve nearly 4:1 ROAS. We established a mix within the video category that achieved both high reach at a low cost (TrueView & Preroll) and high return (Native). It was an easy decision to dedicate 10% of marketing funds to our local Atlanta media mix for 2018. Up next in our evolving video strategy? OTT device (over-the-top) and FEP (full-episode-player) initiatives to reach the growing millennial audience that is truly incremental to the traditional cable viewer base. Throughout our 4+ year partnership with Papa John’s, the tried and true tactic that has always yielded positive ROAS is programmatic display. An evolving tactic in-and-of itself, programmatic display was established as a tactic that achieved both awareness and drove orders. But how did we convert this traditionally upper-funnel tactic into an order-driving machine? It takes more than just a wide-reach approach to get banners like the one you see below in front of the right person, at the right time, when they are likely ready to order…. Thus began our dedication to testing and evolving our audience targeting capabilities. Our team of programmatic media buyers asses a wide-variety of criteria to determine which ads to serve, when to serve them, and who to target. Targeting users based on where they go in the real world. This was best used to target competitors by serving ads to people who frequently visits other pizza delivery and QSR restaurants. We also used this to target quality audiences – we identified others brands that carry a similar quality message as Papa John’s (Panera, Chipotle, Starbucks, Wendy’s, Chick-fil-a, Target) and served ads to people who go to those stores frequently. Aligning with delivery areas to serve ads only in relevant geographic areas where customers and potential customers are likely to live & work. An audience that is dynamically created based on our current customers. We target people who “look like” our current customers in both their demographic information and their online behaviors. As you can see above, Cardinal doesn’t settle for the typical display targeting tactics. Programmatic may prove to be effective; but we are continuously looking for ways to make each dollar stretch just a little bit further. We created a new programmatic display audience in the Atlanta market: take all users who ordered $25 or more in the past 6 months and go find more potential customers who look like these top-tier customers in their online behavior and demographic characteristics. 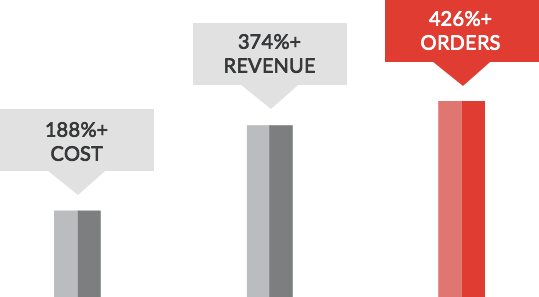 If each dollar spent on advertising could generate a slightly higher ticket average (more revenue) we could improve the ROAS of an already highly-efficient tactic. We then set up an A/B test to serve the same ad to both our “standard” audiences compared to our “higher-ticket” audiences. Include a unique offer that is inherently designed to generate a higher ticket and the end-result was an increase in the average ticket (AOV), which in turn increased our return on ad spend during the test period. The only way to run successful ad campaigns is to test your campaigns, research your marketplace, and make changes frequently, but only when necessary to improve. If our work with Papa John’s has taught us anything, it’s that there is no shortage of opportunity to reach the right audience with the right message, and that opportunity is a continuously moving target. Take, for example, the time of the day we call Pizza Primetime. Research shows that customers make mealtime decisions within an hour of when they ideally want to eat. Targeting ads across the web and social media around that exact time is what makes it possible for us to lower cost-per-order and deliver the highest return on ad spend. We’ve also targeted ads at people who frequented other pizza delivery and QSR restaurants through an evolving conquesting campaign; we’ve developed lookalike audiences across all franchise locations to expand reach and implemented geo-fencing strategies that serve ads aligned with delivery areas specific to franchise locations. 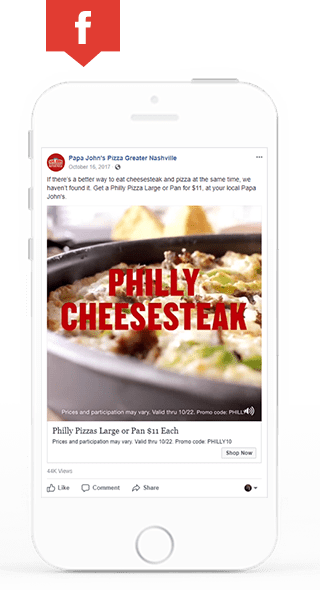 And not to forget core remarketing strategies that display ads to audiences that have visited or engaged with Papa John’s online, on mobile and on social media. In short, we’ve married the art with the science of hyper-local marketing for a national brand. By differentiating our strategies based on the data in front of us, we have successfully driven hyper-local results throughout the Papa John’s system.